The new Metropolitan Police commissioner has said the force's relationship with the media "has gone too far". 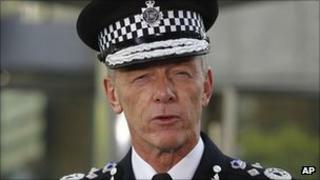 Bernard Hogan-Howe said he would reset the boundaries between police and media following the phone hacking inquiry. The commissioner said new guidelines will be issued for police officers associating with journalists. He made the comments as he addressed members of the Metropolitan Police Authority (MPA) for the first time. Speaking at City Hall, he called for an era of transparency and austerity. He said: "I don't think anyone is going to argue that the police service should not have a relationship with the media. He said standard operating procedures at the force would be updated at the conclusion of inquiries launched after allegations of police corruption surrounding activities by journalists at the News of the World. Mr Hogan-Howe added: "I hope myself that we do not go back to where we were when I joined the service 30 years ago when we didn't talk to press at all - even when we were talking about crime. "What's happened over time is that that relationship has gone too far. We have to reset the boundary." On Wednesday, Scotland Yard published a list of gifts officers had received after the force came under pressure over Sir Paul Stephenson's resignation as commissioner. Sir Paul quit at the peak of the phone hacking scandal after facing criticism for receiving free treatment at a health spa. A subsequent inquiry cleared him of all wrong doing. When asked about his own policy on receiving gifts, Mr Hogan-Howe told the MPA: "You do not receive hospitality from people you are investigating."